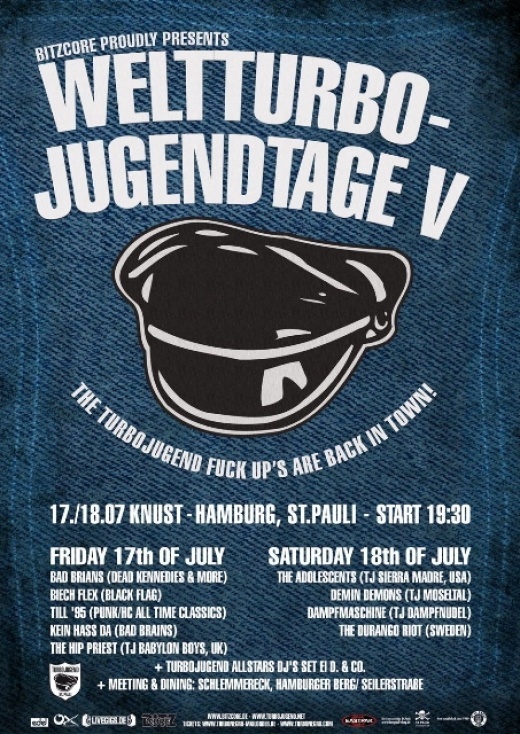 WE'RE HAPPY TO ANNOUNCE THE FIFTH WELTTURBOJUGENDTAGE (WTJ V) IN HAMBURG AT THE 17TH AND 18TH OF JULY 2009. AFTER LAST YEARS' WTJ IV SUCCESS (REMEMBERED BY MANY VETERANS POSSIBLY AS BEST WTJ DAYS SO FAR) HERE'S ANOTHER CHANCE TO MEET WITHIN THE INNER CIRCLE. BE PART OF THIS HISTORIC EVENT AND GET YOUR BUNDLE TICKET TO MAKE SURE YOU CAN BE PART OF THE EVENT IN ST. PAULI; ENJOY THE BIG PARTY IN A VERY SPECIAL ATMOSPHERE AND WITH DELEGATIONS OF THE 2.800 TJ CHAPTERS FROM ALLOVER THE WORLD. MEET OLD AND NEW BUDDIES AND HAVE A GENERAL GREAT TIME. The Early arrivers pace yourselves starter night at TJ St. Pauli club home Schlemmereck (corner of Seilerstrasse/Hamburger Berg) including an acoustic set by the Denim Demons. 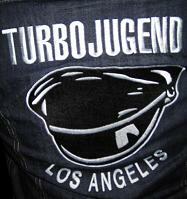 plus Turbojugend Allstars DJ's set w/ Mike Fast & El D.
The Fischmarkt rumble: Meeting point at 5:00 a.m. around the King Calavera/Cobra Bar. Later workout at the Schlemmereck. Check the TJ Mailorder for order information. The tickets will be sent out in (late) May 2009 via registered postal service. It is possible to pick up the tickets (jackets as well) at our office before the event (i.e. Thursday, Friday and also on Saturday afternoon-for alternative dates get in touch). In this case please deduct the postage costs from the order and just transfer the money for the ticket prices. Please send a mail to mailorder@bitzcore.de for this matter (also if you have any questions) and bring a copy of the invoice (which we are going to mail to you) when you pick up the tickets. Denim jackets: every order that is paid before end of June will be delivered in time for WTJ Days or can be picked up at the Mailorder office. Attention: sizes M and the Girls sizes have limited stock and might be gone soon. First come, first serve! Knust, St. Pauli-North, Kampstrasse 30 - near Millerntor Football ground and the big WWII shelter. The Knust area is also the meeting and hanging out center for Jugends. The place will be open late afternoon at both days.